CNG and LPG have become ‘The Fuel’ for the automotive sector due to their price competitiveness and are slowly and gradually replacing conventional liquid fuels. In order to actively participate in ventures related to CNG and LPG, a separate segment for ‘Gaseous Fuels’ was formed in 2006. This highly lucrative and potential energy segment looks after the existing businesses of CNG and LPG and also capitalizes on business projects related to the same. Gaseous Fuels department operates through its four divisions across Pakistan at Karachi, Lahore, Multan and Islamabad. PSO’s four LPG Plants have a total storage capacity of 780 MTs including 180 MTs of bottling facility present in Lahore, Dhurnal and Akora Khattak regions which makes PSO efficient in supplying LPG to the general populace. 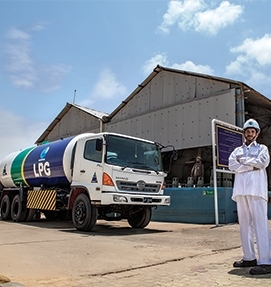 Our LPG Plants are equipped with state of the art electronic cylinder filling facility enabling and ensuring accurate quantity to our valuable customers, proper LPG Bouzer decanting and filling system with all four LPG Plant Health, Safety and Environment complaint and ISO: 9001:2008 Quality management Systems are in place.